The Paceman has been designed to combine the classic MINI concept with the defining features of the MINI Countryman and the style of a coupe. 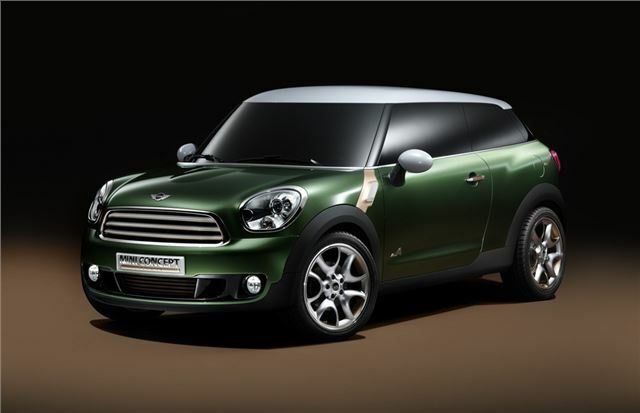 The concept car retains the familiar MINI face and like the Countryman has large headlights and chrome surrounds that extend deep into the front wings along with a contoured bonnet. The grille is essentially the same as that of the Cooper S Countryman apart from additional air intakes in the bumper to deliver improved brake ventilation and the incorporation of new deep set fog lights. The familiar MINI shoulder line that rises towards the rear of the Paceman Concept also hints at its sporting intent. Less familiar is the glass and roof. As the waistline rises the flat roofline flows into a wide C-pillar that appears to be transparent. The windows appear to wrap around the car like a band of glass with the roof ‘suspended' on top and painted in a striking, contrasting colour. This is known as the ‘helmet' roof. The coupé-style windows taper towards the rear and the whole effect is one of a dynamic wedge shape. The MINI Paceman Concept measures 4,110mm in length, 1,789mm in width and 1,541mm in height. In archetypal MINI style, the Paceman has extremely short front and rear overhangs to facilitate the familiar go sharp driving feel. The interior draws on MINI's unique design language, but also has a fresh new look. The central air vents, central speedo and gearshift lever feature outer rings in a contrasting colour while large side air vents underline the MINI character still further. The slim centre console, which maximises legroom for the driver and front passenger, fuses with the Centre Rail first seen on the MINI Countryman. This innovative rail system runs along the centre of the passenger compartment as far as the rear seat backrests. Behind the front sports seats are two comfortably-shaped individual rear seats designed with backrests that merge into the seat sides in order to create fully contoured passenger support. The MINI Paceman is powered by the MINI John Cooper Works 1.6-litre twin-scroll turbocharged engine. This 16 valve, four cylinder unit develops 211bhp and generates maximum torque of 260Nm with an extra 20NM available thanks to an overboost function. As it's based on the new Countrman, the Paceman is available with the MINI ALL4 permanent all-wheel-drive system. ALL4 features an electromagnetic centre differential positioned directly on the final drive which varies the distribution of power seamlessly between the front and rear axles. In normal driving conditions up to 50 per cent of the drive is sent to the rear wheels, but in extreme situations as much as 100 per cent can be directed to the rear. The MINI Paceman Concept is also available in two wheel drive form.